The Alliance of American Football had football fans excited about the opportunity to watch football in the spring being played by players they had heard of. But eight weeks into its 10 week inaugural season, the AAF announced on Tuesday afternoon that it is suspending all football operations. Many reports indicate that this is a de-facto folding of the league. With the suspension of the Alliance of American Football, it shows yet that America’s favorite sport is not professional football, it’s specifically the NFL. Optimism was high going into the season, and the league had a strong start, drawing ratings for that beat the NBA on its opening weekend. But just 10 days after kickoff, the AAF was in jeopardy. According to reports, the AAF did not have enough money to pay players until NHL Carolina Hurricanes owner Tom Dundon saved the day. The Athletic reported Dundon invested $250 million to fulfill its financial needs, which immediately made him the chairman of the league and gave him the power to make unilateral decisions. According to AAF co-founder Bill Polian’s statement to Action Network reporter Darren Rovell, Dundon used that authority in making the decision to suspend operations. According to Ryan Kartje of the OC Register, co-founders Charlie Ebersol and Bill Polian were not in agreement with Dundon’s decision. 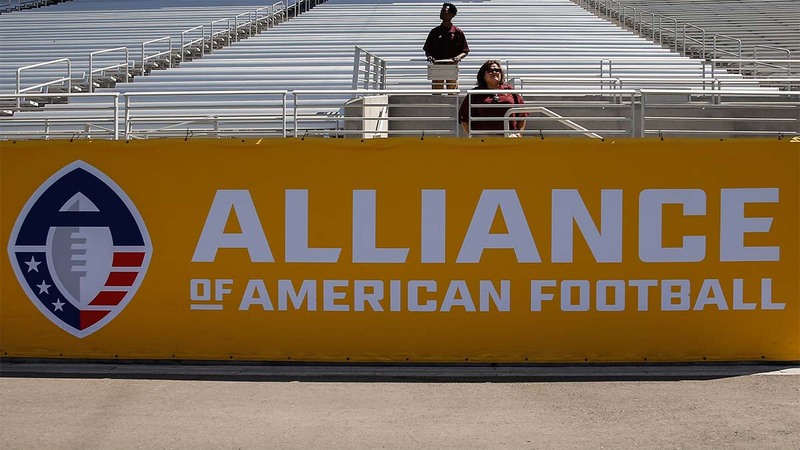 With Tuesday’s news, the AAF becomes the latest cautionary tale on how hard it is to start a successful professional football league in the U.S. in the shadows of the NFL. Since the AFL-NFL merger in 1966, numerous football leagues have attempted to take the NFL’s crown as the top professional football league or, at least, carve out a sustainable piece of the financial pie. While those leagues brought innovations to the game that the NFL adopted, the leagues themselves failed. The USFL was founded with the goal of being an equal to the NFL. The league made a television deal with ABC and ESPN in 1983 to broadcast the games. Donald Trump took over ownership of the New Jersey Generals after the first season was underway. Many players who went on to prominent, and even Hall of Fame-caliber, careers in the NFL started in the USFL, including Jim Kelly, Herschel Walker, Steve Young, Reggie White and Mike Rozier. The downfall of the league was not only the decision to move the season from spring-summer to the fall, but also the ill-conceived abandonment of the league’s financial plan and principles. The USFL sued the NFL in an antitrust lawsuit. The USFL won the lawsuit, but won a grand total of $3 in damages. The NFL’s following was way too large for another professional football league to directly compete against it in the same months. The rules were mostly the same as the NFL. However, it had its own spin on a few things. The USFL was the first league to introduce instant replay and the two-point conversion. The UFL was founded by Bill Hambrecht in 2009 and consisted of four teams. It was played in the fall in direct competition with the NFL and college football. During the 2008 season, the NFL and NFLPA could not come to an agreement on salary cap, which eventually lead to the lockout on March 12, 2011. Hambrecht created the league in hopes the NFL would have a work stoppage, leaving the UFL as the only game in town. When the NFL came to a new labor agreement on July 25, 2011, the UFL’s aspirations for success ended. The league’s final season was 2012 and was followed by lawsuits from coaches and players alleging they were owed money. WWE Chairman Vince McMahon announced the formation of the XFL in 1999. The league was co-owned in equal shares by the WWE and NBC. However, the league lasted one season. In that season, the league lost $50 million, according to the Wall Street Journal. As for the on-field product, the XFL set out to be different from the moment the players took the field. Instead of a coin toss determining who gets the ball first, each team selected one player to race from the 35-yard line to the 50 to pick up a football. Whoever got the football decided if their team would kick or receive. If the punter punted the ball out of bounds, the kicking team would be penalized. Only one player could be in motion before the snap, and they would have to be lined up outside the tackles. The most iconic difference between the XFL and the NFL at the time was the fact the XFL allowed excessive celebration. The NFL was tagged as the “No Fun League” because assessed penalties to players and teams that celebrated after touchdowns. McMahon announced in 2018 a revival of the XFL, scheduled for the spring of 2020. Sticking with eight teams, the XFL wants to field a more family friendly product this time. The newest professional football league started its inaugural season in March. Much like the XFL, the AAF was a spring season league, ensuring it did not compete against the NFL. Charlie Ebersol, the AAF founder, talked about some of the different rules the league had on the Dan Patrick Show. Among them, he mentioned the kickoff rule which automatically starts a team from the 25. Other rule changes involve the onside kick. The equivalent of the onside kick is giving the team the ball facing 4th-and-10 at their 35-yard line. If the team converts the first down, they continue the drive. If they do not convert, the opposition will take over on downs from where the ball was last. Just eight weeks into its first season, the AAF folded. With the XFL still planning to start again in spring 2020, the quick start but ultimate failure of the AAF is yet another example of just how difficult it is to build a successful professional football league underneath the NFL’s shadow. Anthony De Bono is a junior sports journalism major at Arizona State University.